I had been dying to try out the food at Olivor Twist and decided to drop by last week on $5 martini night (Wednesday). I've gone to martini night in the past and have had good appetizers and drinks, so I figured I'd go back and try some other martinis for cheap and check out the food for not so cheap. Since the warm Cleveland nights are dwindling, my boyfriend and I sat on the patio. We sat next to a really nice lion's head water feature, although the sound of the running water was drowned out by the loud revving of motorcycle engines for a big part of the time we were there. I started out with a peartini, made out of Grey Goose pear (although the vodka sure didn't taste like Grey Goose to me! ), Pama Pomegranate, pineapple juice, and white grape juice. What I tasted was grape juice. And I HATE anything that tastes super grapey. But for $5 I figured I could choke it down fairly easily, especially since the drink was made with such little alcohol. For my meal I had the house salad ($7), which ended up being the best part of my meal. The dressing had a nice garlicy zip to it and the asiago cheese added a nice flavor to the field greens. Service was painfully slow, but I was able to order the Lex Luthor martini before I got my meal. It was made out of gin, blue curaco, midori melon, 7UP, and lemon juice. It was literally neon blue - in the dark. I generally like any martini made with midori, but the flavors in this martini didn't work well together. I was again thankful that I'd only paid $5 for it and not the full price. For my meal, I ordered a red pepper pesto with artichoke hearts, olives, and tofu. I realize the picture is awful, but what can you notice? 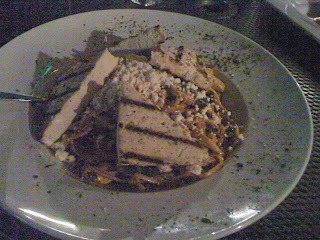 Huge chunks of tofu on top of the pasta. Huge unseasoned, un-marinated chunks of tofu. It was almost comical. It was as if someone had sliced open a package of tofu, cut it into triangles, slapped it on a grill and then plunked it on top of pasta. If anything, the tofu ruined this dish. It was so completely awful that I took one bit of it and then picked it off of my plate. The pasta itself was ok - the olives were clearly canned but the pasta tasted fresh and there were quite a few artichoke hearts. Overall my evening at Olivor Twist was ok at best. I think I'll stick to getting my $5 martinis at Melange, Bar Louie, or Bodega where the flavors of alcohol work well together and they use premium vodka - even on their bargain martini nights. that's friggin' hilarious. can't say that i've had the pleasure of dining there. from the looks of things, neither can you.